With major renovations being made to KPU Surrey’s Spruce building, it’s easy to forget about the institution’s soon-to-be fifth campus, which is currently under construction in Surrey Central. The campus is part of a massive building project at 3 Civic Plaza, near the Surrey Central Skytrain station and SFU Surrey. The complex includes residential and office space, a Marriott hotel, and five floors that will soon belong to KPU. “This was an important step for KPU and this was the right location and the right building to be in,” says KPU president Alan Davis. When the Civic Plaza campus was first announced, it was initially expected to be completed in November of last year. That date was later pushed to late this summer, and now it’s tentatively planned for completion in early 2018. Davis says that the university is not privy to the reasons for the delay, as construction is completely under the domain of Century Group, the complex’s developer. The university has been using the time to flesh out plans for programming, interior design, and facilities. KPU originally planned to occupy only three floors of the complex, seeing the space as a satellite location to the four main campuses. After being approached about expanding to occupy five floors, the KPU administration is now looking at the space as a full campus in its own right. The university will control an entire podium of the complex. The university has been working with an architectural firm to nail down what they want the look and feel of the new campus to be. Details are currently sparse as to what’s in store for the design, but Davis says it will include traditional classrooms as well as more configurable spaces with movable walls. There will also be collaborative work, study, and student gathering spaces. The central location was a key factor in the university’s decision to open another campus. It was originally Century Group that approached KPU about the possibility having a presence at Civic Plaza. Davis says that the administration jumped at the opportunity because they had felt that it was important for the university to have a presence in Surrey’s downtown core for a long time. Davis notes that the proximity to the Skytrain will make KPU more accessible to those coming to the university from elsewhere in Metro Vancouver. With the Marriott hotel also part of the complex, there will be potential to use the space for major university and community events, with guests being able to lodge conveniently nearby. Having SFU right across the parking lot will also provide opportunities for synergy and collaboration between the two institutions, Davis hopes. There are no plans for existing KPU programs to move to the new campus. Instead, the university is preparing several new programs to launch at the same time as Civic Plaza’s opening. These include three new post-graduate programs for the KPU School of Business in Operations and Supply Chain Management, Technical Management Services, and Accounting. These will be the first post-graduate programs offered by the university. There will also be upper level undergraduate business courses and professional development programs for corporate clients and continuing professional development studies available at the new campus. The Kwantlen Student Association already has plans for student space at Civic Plaza. A couple of years ago they set aside funding for a startup incubator that would give KPU students the resources and guidance to make their business ideas into reality. One of the issues the KSA has faced with this initiative was finding space on campus where office space is at a premium. With the announcement of a fifth KPU campus the KSA may have found a home for the project. 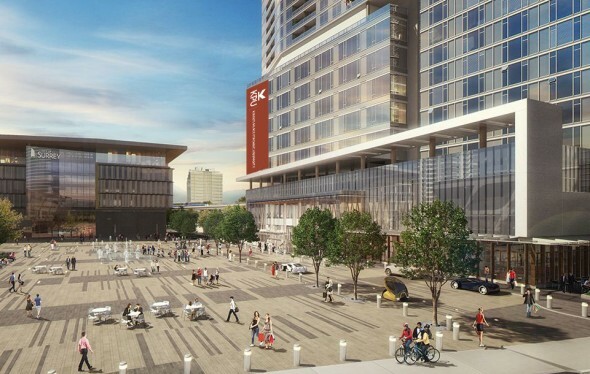 Unlike other major building and expansion projects currently being carried out by KPU, the Civic Plaza project will receive no funding from the government or other outside sources. The university is self-funding the project via capital reserves that are put away every year from university profits. Still, Davis says that the university is receptive to major donors looking to provide additional funding in exchange for the naming rights to facilities.